Many homeowners looking for a top quality house siding debate between installing LP siding or Hardie Plank. While Smart siding is the newcomer to the residential market, with only about 20 years in business, its popularity across the US is growing very fast. In fact, many faithful Hardy Board siding homeowners, contractors and builders have switched over to LP. Lets compare the costs, specs and benefits of Hardie vs LP, so you can decide which is a better choice for your house. One of the biggest reasons many builders and homeowners choose LP over Hardie Plank siding is the significant cost difference. Across the US, Smartside is about 25-35% cheaper than Hardie. This difference amounts to thousands of dollars! LP is cheaper because both the materials and labor cost less than James Hardie. On average, Hardie siding costs about $7-9.5/sq.ft. installed, where as LP costs about $5.5 – 7.5 per sq.ft. installed. Use our Siding Calculator to quickly estimate the cost of different materials for your house. LP Smart siding is a more upscale looking, higher quality product than vinyl, which is the cheapest option. Many people find that there is no reason to pay such a high premium for Hardie Plank, if LP offers great curb appeal and quality at a fraction of the cost. On the other hand, others would rather spend more money to have the peace of mind that they are installing a product with such a long and successful history as James Hardie. Also, this makes a difference when selling a home: pretty much everyone recognizes the Hardie brand. Many prospective buyers really like the fact that a home is clad with a Hardie product. Which Siding Looks More Like Wood? If you really want the look of natural cedar wood, you have to closely examine both Smartside and Hardie to see which one is a better replica in your eyes. The general consensus is that LP has a deeper wood grain pattern than Hardy Plank. 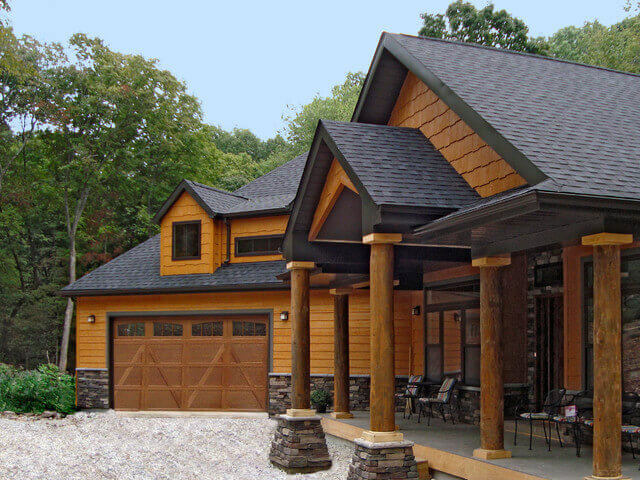 Also, many builders and homeowners find that LP shakes have a more rustic hand-split look and feel, which works well for cabin style homes. On the other hand, Hardie Shake has a more classic cape-style look that many homeowners prefer. Thus, its not uncommon to see homeowners install LP lap siding combined with Hardie shakes for accents in the gables. In fact, putting shakes in the gables is a great way to boost your home’s curb appeal. One of the best things about Hardie is that it is not susceptible to termites. The reason is simple, fiber cement is simply not appealing to termites or any other insects. The same cannot be said about Smartside. Because it has wood as part of its composition it is susceptible to termites, just like any other wood product. This is exactly why, LP explicitly states in their warranty, that termite damage is NOT covered. Consequently, if you live in a region where siding is known to be prone to termite damage, smart side would not be the best choice. Since LP is made of wood strands and resins, its more impact resistant than Hardie Plank, which is made of cement. It is the cement that makes all fiber cement siding, including Hardie, more susceptible to breaking or denting on impact. For example, LP Smart Side will remain intact on contact from a thrown gulf ball, baseball, rock, or another similar object. However, Hardie may have a noticeable dent from the same type of impact. In terms of hail, its very important to note that LP DOES NOT provide hail coverage in their warranty. James Hardie warranty DOES cover their HZ5 and HZ10 products in the case of hail damage. Note: In the interest of presenting OBJECTIVE information, we discovered the following in our own research: LP claims that NASA has done an impact resistance test of their siding, proving it to be superior to fiber cement. It says that the link to full report can be found on their website. However, we have not been able to locate the original report either on the LP website or anywhere else on the web, including YouTube. This makes the origin of the report and the video that shows the test very questionable. At the same time, real contractors and homeowners report that from their experience LP does stand up well to various types of objects thrown on impact. One of the most important factors that makes a quality siding is durability; its ability to remain intact through adverse weather conditions, moisture infiltration, termites, temperature fluctuations, etc. Both LP and Hardie claim that their product has superior durability. Based on experiences of contractors and homeowners, it seems that both products offer about the same level of durability IF there is proper installation. However, this is a very big IF. 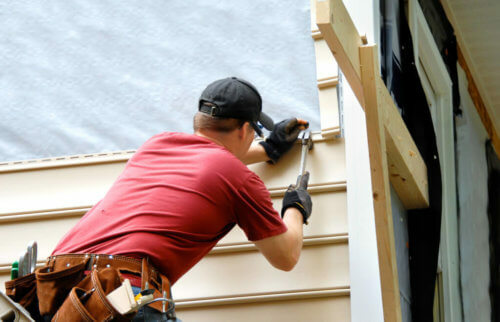 In recent years, many homeowners have reported a variety of issues with Hardie siding, but most of them have been the result of poor installation. It is more difficult to install correctly than LP, because it requires training and special equipment. As a result, homeowners who try to save money by hiring cheaper siding contractors end up with durability issues down the road. Another thing to keep in mind, is that LP offers the same products, regardless of your location. The formulation in their siding remains unchanged. Due to the nature of engineered wood, this seems to work just fine. However, James Hardie has a different model. They have created the HardieZone System, where siding products are formulated to work well in a particular environment. For example, there is the HZ5 line. It is designed for climates with freezing temperatures, extreme seasonal temperature variations, and snow and ice. There is also HZ10 line. It is designed to withstand hurricane-force winds, salty sea air of the coast regions, and the humid heat of the Southern States. Thus, if you are considering James Hardie siding, it is very important to get a product that has been designed for your region. The longer the planks, the less seams are required. This makes installation easier and also offers a more aesthetically pleasing finished look that has less seams. LP has 16 inch long planks, where as Hardie is 12 inches long. This can be a very noticeable difference. You can order Hardie Plank prefenished from the manufacturer. They offer Color Plus Technology, which carries a 15 year warranty. If you like one of their colors, this can be a great way to save money, because you will not need to paint your house for the next 15 years. Considering that you would need to repaint about once every 5 years, and the cost of painting is about $1.5-3/sq.ft. you would be spending from $3,000-6,000 every time. In 15 years, you would save $18-30,000! Smart siding does not have this option. Alternatively, both products can be prefinished through a number of different outlets, and your contractor can arrange this process. LP offers trim boards that have a cedar wood texture, whereas Hardie only offers smooth trim. Consequently, many homeowners prefer the LP trim, and even use it in combination with Hardie Plank. When it comes to fire resistance, Hardie will do a better job protecting your house that LP. This will be especially true in common situations, such as forgetting to move your grill away from the siding (this is one of the most common damages that homeowners do to their siding, and then need to repair it). In this case Hardie survives the close proximity to the grill, while Smart siding does not. Moreover, if you live a community, where houses are very close together, and your neighbor’s house gets caught on fire, Hardie will be more resistant to damage from the heat and smoke than LP Smart siding. Finally, when it comes to real fire, Hardie is ASTM rated for fire resistance and will not catch fire. This is not the case with LP Smart siding. Because it is made from wood, LP will catch fire. However, LP does offer a FlameBlock panel which is rated for fire resistance, so you can also consider this product. Since Hardie is heavier than LP, its more difficult and time consuming to install. Moreover, many contractors complain the Hardie planks have a tendency to break during installation, which increases material costs due to waste and prolongs installation time. LP typically does not break during installation. Also, it is easier to cut than Hardie and does not require any special tools. Moreover, because LP boards are longer and lighter than Hardie, they are also quicker and easier to install. For all these reasons, many contractors switch from Hardie to LP. However, there is a very BIG catch, when it comes to installing LP siding that you as a homeowner should be aware of. In order to install LP properly, a contractor would need to prep and paint EVERY edge of every piece that he cuts ( he would not need to do this with Hardie). The problem is that most contractors simply close they eyes on this requirement and don’t do it in order to save time. So, if you are installing Smartside, it is very important that you make sure that your contractor will prime and paint every edge. Find an experienced local siding contractor and get free estimates. Which Manufacturer Offers Better Warranty? When you invest thousands of dollars into a siding product, its important to ensure that you are getting a great warranty. Read the fine print on the warranty, to know exactly what is covered and under what circumstances. As a quick summary, Hardie offers a 30 year limited warranty on their boards and 15 years limited warranty on their trim. They also offer a 15 year warranty on their factory color finishes. Keep in mind that Hardie siding from different zones, will have slightly different warranties, so its important to carefully read the details. I-80 OR WEST OF THE CASCADES IN WASHINGTON, OREGON AND CALIFORNIA. When you are deciding between installing Hardie vs Smart siding, you have to keep in mind that there is a strong contractor bias. If a contractor has been installing Hardie his entire career and has had success with it, he will tell you to just go with it, because it has been tested and proven to work over time. He will either not have any opinion about LP or will have a cautious one, since its a new product. On the other hand, if you have a contractor who has started installing a lot of Smartside, he may give you a very different opinion. He may tell you pros and cons of LP based on his own personal experience. 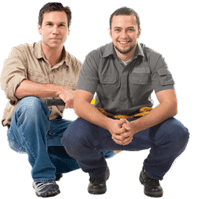 Ideally, you want to talk to a few contractors who have installed both products to get a real sense of which one may be better for you. Siding products manufactured by LP are currently 20 years old. They went into production in 1997. Prior to this, LP manufactured another siding product called LP Inner Seal, which had major problems, and was eventually discontinued after a major class action law suit against LP. The new Smartside siding has a completely different formulation that the Inner Seal and has not had any of the problems that plagued its predecessor. Because over the past 20 years, Smart Side has been performing well across the US, it is continuing to grow in popularity as a good quality siding option. By comparison, James Hardie has been manufacturing fiber cement siding in the US for 127 years! During this time, the company has continued to invest into research to produce durable quality siding. As a result, Hardie is the most popular fiber cement brand in America. 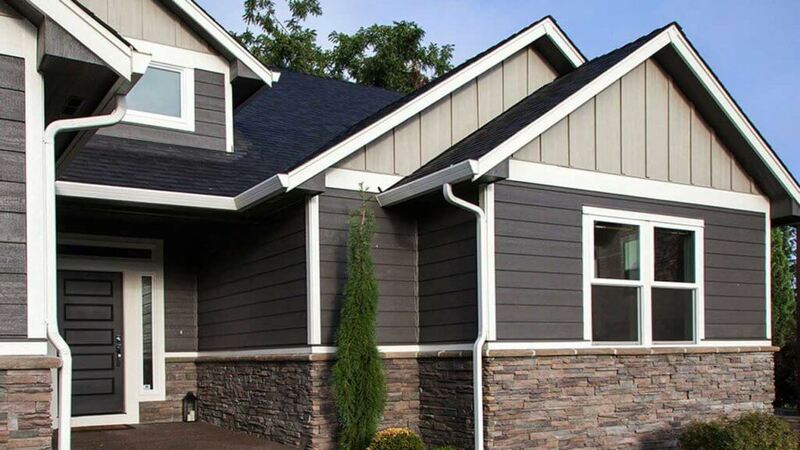 In fact, to most people the term “fiber cement siding” is synonymous with Hardie. Thanks for sharing this great article. I want to say details about LP siding. LP SmartSide came into the marketplace in 1997 with barely a blip on the radar. LP had just gone through the fiasco of their earlier Oriented Strand Board (OSB) siding product, Inner Seal, which had major problems. Plank length should be in feet, not inches. Are you using watercolors to paint houses in your neck of the woods?! ?